/Zilla Parishad/MPP Schools in the State of Telangana, herein after referred to as Teacher in these Rules. counseling through Transfer Committees constituted for each district / zone. The following categories of Head Master, Gr.II (Gazetted) / Teacher in the Government / ZPP /MPP shall be transferred. Head Master Gr.II (Gazetted), who have completed (5) years of service in a particular School as on 1st July of the current year shall be compulsorily transferred, provided those who are going to retire within two years from 1st July of the current year shall not be shifted until and unless the incumbent requests for such transfer. Teachers, who have completed (8) years service in a particular school as on 1st July of the current year shall be compulsorily transferred, provided those who are going to retire within two years from 1st July of the current year shall not be shifted until and unless the incumbent requests for such transfer. /Teacher aged below 50 years as on 1st July of current year and working in Girls High School. Head Master Gr.II (Gazetted) / Teacher who has completed a minimum period of two years service in a category of post in a School as on 1st July of the current year shall be eligible to apply for transfer. The Head Masters Gr. II (Gazetted) / Teachers shifted under Rationalization i.e., Primary Schools, Upper Primary Schools and High Schools shall also participate in the Transfers Counseling, provided those who are going to retire within two years from 1st July of the current year shall not be shifted until and unless the incumbent requests for such Transfer and next junior shall be shifted. If other junior Teacher is not available he/she shall be shifted. The Head Masters, Gr.II (Gazetted) who has completed (5) year of service and Teacher who has completed (8) years of service as NCC Officer, shall be posted in a vacancy in a School where there is NCC unit. All transfers shall be affected within the present Management, Agency Area to Agency Area, Plain Area to Plain Area. Service in category IV areas: Five (5) points for every year of service and 0.416 for every month. Service in the Category II areas: Two (2) points for every year of service and 0.16 for every completed month. Service in the Category I areas: One (1) point for every year of service and 0.083 for every completed month. Category – I: All Habitations / Towns where 20% and above HRA is admissible. Category –II: All Habitations / Towns where 14.5% HRA is admissible. Category –III: All Habitations / Towns where 12% HRA is admissible. % HRA is admissible , and which do not have connectivity through an all weather road as per the norms of the Panchayath Raj ( Engineering) Department. The President and General Secretary of the Teachers' Associations having OD facility in terms G.O.Rt.No.1410, G.A.D. (Ser.Welfare) dated 20-05-2015 at the State and District Levels are eligible for ten (10) points. Ten (10) points for un-married Head Mistress, Gr- II / Female Teacher. 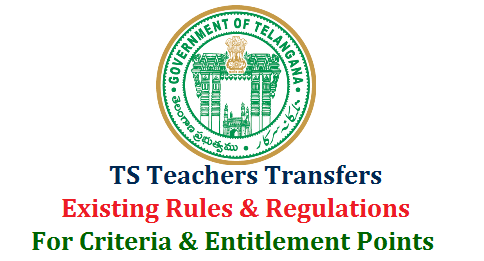 / Teacher, whose spouse is working in State Government or Central Government or Public Sector undertaking or Local Body or Aided Institution in the same District and opted for transfer nearer to and towards the place of working of his/her spouse, benefit of spouse points shall be applicable to the Head Master Gr.II (Gazetted) once in (5) years and Teachers once in (8) years. An entry shall be made in this regard in the Service Book. A copy of the Certificate issued by the competent authority shall be enclosed to the check list to consider cases under this category. (15) and who have got State award issued by the State Government will get (10) points respectively . He/she is eligible for only one category whichever is highest. State level – 5 points. District level – 4 points. Mandal level -2 points. the seniority list, in the order given below, irrespective of their entitlement points. Note 1: For the purpose of (d, e & f) above, a copy of the Certificate issued by a competent authority i.e., District Medical Board / State Medical Board should be enclosed to the application for consideration of preferential categories. (II) (c) once in (8) years, and an entry be made in the Service Book. Rationalization without completion of (8) years of service shall be given the respective benefits / entitlement points along with the Rationalization points.